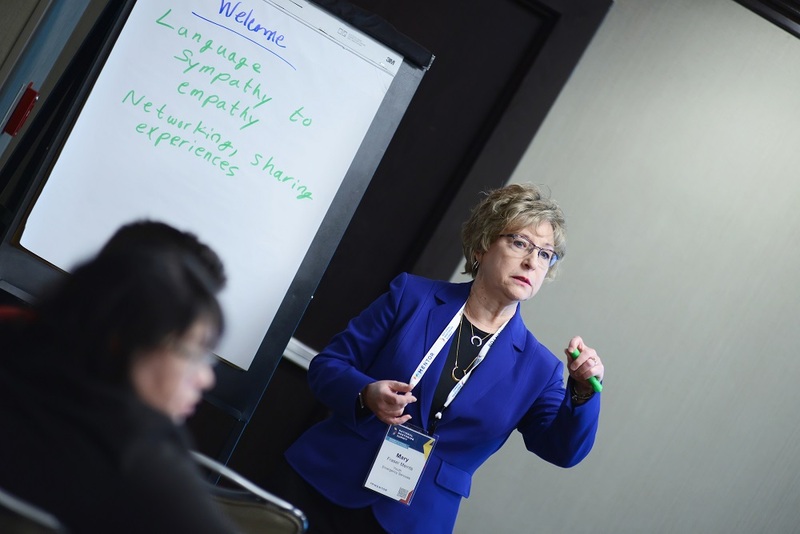 The 2019 National Mentoring Summit features more than 80 workshops that explore this year’s theme: “Building Relationships, Advancing the Movement.” This year’s workshops offer a versatile array of prevalent topics such as mentoring immigrant youth, how to make programmatic changes based on research and data, collective impact in the mentoring field, and mentoring youth with mental health challenges.Workshop sessions showcase exemplary program models, collaborations, research, and innovations that have positive implications for strengthening the mentoring field. There will be three workshop sessions on Thursday, January 31st and two workshop sessions on Friday, February 1st. Please browse the workshops here as you will be asked to select your workshops during registration. The 2019 National Mentoring Summit will feature five tracks that highlight specific areas of interest! These tracks will enable attendees to easily register for workshops most applicable to a specific area of focus, and will provide enhanced networking opportunities through designed opportunities to connect to others in the same track.This year's tracks are: Advocacy, Philanthropic Partnerships, Culturally Specific Practices, Nonprofit Management, Research and Supporting the Mentoring Match. View all sessions below, or select a topic to view a sampling of workshop options. Participants must travel to Washington, DC on Tuesday, January 29 to participate in the Capitol Hill Day training. Capitol Hill Day participants will receive regular communications starting in December with tips and resources to assist them in preparing for the Congressional appointments MENTOR will schedule for them. New (and returning) participants will be encouraged to join a webinar training in early January and all will gather for an in-person training the evening before Capitol Hill Day to learn, prepare and network along side colleagues from their state and across the country. Advocates are encouraged to bring materials and information about their mentoring-related efforts to share with their legislators. Capitol Hill Day, which takes place Wednesday, January 30th, capitalizes on the energy of the hundreds of passionate and experienced advocates attending the 2019 National Mentoring Summit. Capitol Hill Day participants will meet with Senators and Representatives from their states about key bills and issues in Congress, as well as the mentoring efforts happening in their communities. Capitol Hill Day participants will receive training and materials to assist them in preparing for their Congressional appointments and also gather in person before Capitol Hill Day to network and strategize for their meetings with other participants from their state. Advocates are encouraged to bring materials and information about their mentoring-related efforts to share with their legislators. Capitol Hill Day participants will be prepared to improve or establish relationships with their members of Congress and staff; educate legislators about their work back home, including possible challenges in their communities; and, encourage legislators to support key bills and federal programs. Participants must travel to Washington, DC on Tuesday, January 29th to participate in the Capitol Hill Day training. The Welcome Reception for attendees of the National Mentoring Summit will occur on Wednesday January 30th, 2019 from 4:00-6:00 PM in the Kennedy Caucus Room on Capitol Hill. Capitol Hill is an easy Metro (subway) ride from the Renaissance Hotel. We look forward to welcoming you to Washington, DC at this fun, nonpartisan event with hors d'oeuvres and beverages. Meet author Donna Orender and pick up a copy of "WOWsdom! The Girl’s Guide to the Positive and the Possible. Jam-packed with letters, activities, and life-changing advice. It celebrates the connection of the WOW of girls and the WISDOM of women and lets girls know they are not alone in this world. In letters written to themselves, women, men, and girls from all walks of life—artists, athletes, actors, business leaders, entrepreneurs, students, doctors, scientists, and humanitarians—share their hard-earned wisdom for girls who are seeking guidance and inspiration as they begin their journeys of discovery. It started as a Kickstarter with enthusiastic supporters who believe that transforming the lives of girls elevates us all. We know when we live together and learn together, we will ultimately lead together. WOWsdom! is a significant step to making that dream a reality. WOWsdom.com "
Americans agree: Mentoring is a systemic way to solve problems, bring people together, and address inequality. From a youth performance to some of the world’s most recognizable brands, this kick-off session is a dynamic combination of performance and conversation that highlights how we are driving equity – and the mentoring movement – through the power of relationships. Stop by the Summit Featured Author’s space by Grand Registration to meet leading voices in the mentoring field Donna Orender, Julia Freeland Fisher, and Dr. Brenna Bry. "WOWsdom! The Girl’s Guide to the Positive and the Possible. Jam-packed with letters, activities, and life-changing advice. It celebrates the connection of the WOW of girls and the WISDOM of women and lets girls know they are not alone in this world. In letters written to themselves, women, men, and girls from all walks of life—artists, athletes, actors, business leaders, entrepreneurs, students, doctors, scientists, and humanitarians—share their hard-earned wisdom for girls who are seeking guidance and inspiration as they begin their journeys of discovery. It started as a Kickstarter with enthusiastic supporters who believe that transforming the lives of girls elevates us all. We know when we live together and learn together, we will ultimately lead together. WOWsdom! is a significant step to making that dream a reality. WOWsdom.com "
Even though we value them we all cringe at the word “Icebreaker.” We find them to be awkward and trivial, but image a world where you could interact and get to know people in a fun and safe setting. In this workshop we will talk about how to make team building a more engaging and meaningful activity. Realizing that sometimes we must buy into a little bit of craziness to reap the rewards of a more cohesive team. This workshop will work to break down barriers using activity-based learning and focus on areas of communication, trust, leadership, and community building. Innovative collaborative intense short-term program involving police mentors and the juvenile courts system. Mentors who are full-time police officers work to improve a strained relationship with the inner city community and youth. Program utilizes an in-depth curriculum to reduce crime and recidivism in the local youth population for first time non-violent offender, and can be incorporated into long term mentoring program. The relationship with mentees from different cultural backgrounds and ages will be explored from a law enforcement perspective. This workshop will explore the importance of introducing mentors to the concept of innovative programs that can better the community and reduce crime. Participants will experience an in depth look at a collaborative program and can leave with tools to implement the program in their own courts systems and police department during the workshop. All participants will leave with an introduction to the complex relationship between a proactive police approach and reducing crime and improving relationships with minority communities. The Center for Evidence-Based Mentoring, based at the University of Massachusetts Boston, is a nationally-recognized thought leader in the field of mentoring research. Led by Professor Jean Rhodes, the Center’s researchers have been conducting investigations on mentoring as it is practiced in a broad range of contexts and methodologies. This session will profile the latest findings in the work coming out of the Center as well as their implications for both researchers and practitioners alike. Disadvantaged children are less likely to experience the support of an adult mentor when compared to more advantaged youth. Innovative approaches are needed to redress this disparity. This workshop introduces Caregiver-Initiated Mentoring (CG-IM) as a potentially useful approach to closing the mentoring gap. Because parents are gatekeepers to children’s social networks, they can play a critical role in increasing children’s access to mentors. This workshop will discuss findings of recent studies designed to understand caregivers’ perceptions of informal mentoring relationships, how caregivers facilitate these relationships, and how programs can invest more earnestly in the strengths of the families they serve. For many nonprofits, including mentoring agencies and schools, technology can be a double-edged sword – offering a great opportunity to broaden horizons, but also bringing with it some uncertainty about its use. What if we could learn to leverage new technology so it becomes critical to the success of our organizations and vital to our work? Join The Mentoring Partnership and Sevenzo as we look at using technology for mission-critical results. You’ll learn how each organization uses new technology to fulfill its mission and advance mentoring. You’ll also work on developing a technology plan to fit your program’s needs and goals. Every young person is asked the universal question, "What do you want to be when you grow up?" Now, more than ever, there are thousands of careers for young people to choose from, that make answering this question extremely daunting. This workshop will provide mentoring practitioners with implementable career focused mentoring tools and methods of engaging industry professionals to support young people in navigating through the career exploration and preparation process. High-risk youth are influenced by their peers more than anyone else. For this reason, cross-age peer mentoring has incredible potential to positively impact youth that many other programs have a difficult time reaching. During this highly interactive workshop, participants will learn how peer mentoring can help close the mentoring gap, and walk away with practical strategies to implement a research-based, cross-age peer mentoring program in their specific setting. Exploring Definitions of Masculinity with Young Men of Color: Through this interactive workshop, attendees will discuss how mentors can support young men of color as they explore definitions of manhood, with a focus on expanding their understanding of positive masculinity. This session will include a: (1) Panel discussion about positive masculinity, featuring research and insights from a focus group with young men of color; and (2) Fireside chat with young men of color. This workshop will present several case studies showcasing successful and unique partnerships between private foundations, state agencies, and MENTOR Affiliates that leverage a quality assessment and continuous improvement process to make strategic investments in local youth mentoring programs. Tremendous growth in the youth mentoring field has resulted in an ever-expanding number of programs that provide choice, flexibility, and increased opportunities for young people who need mentors. However, the sheer number and variety of programs and approaches make it difficult for funders, and policymakers to know what constitutes a safe and effective mentoring program. By participating in this workshop, you will have the opportunity to explore how cross sector partnerships can scale impact and lend credibility and resources to the field. Funders will leave with strategies on how they can identify and make more strategic investments in youth mentoring programs and mentoring practitioners will leave with a better understanding of how participating in a quality assessment and continuous improvement process can help attract additional resources and support to their program. The session will build participants knowledge of the need for mentor advocates and mentor servants who have lived these experiences or education of the cultures, to find ways to advocate as well as facilitate strategies of solutions like bioenergetics therapy, exercise program, yoga classes and other solution that help the physically or psychologically aforementioned traumas by: •Explaining how their shared history and experience in the western world is different •Explaining how said shared history has shaped their cultural practices, family structure, and coping mechanisms •Explaining how to advocate and serve youth who have been physically and psychologically neglected and now in foster care •Explaining how to match mentors for children of color; 1) who works well with whom; 2) who need a more positive role model; and 3) how do you leverage the most effective mentors. Hermanitas Youth Leadership Mentorship Program is a nationally recognized program that has served over 800 Latina girls ages 12-18. Since 2006, Hermanitas has accomplished 100% high school graduation and pursuit of higher education. The program has been recognized by “Fulfilling America’s Future: Latinas in the U.S. Summit” at the White House as well as The White House Initiative on Educational Excellence for Hispanics “Bright Spots in Hispanic Education” award. Join us to learn about Latina demographics and practical ways to integrate culturally specific practices to engage Latinas in mentoring programs. Do you want to know the SECRETS to Reaching Teens through Mentorship? Are your mentors finding it difficult to develop relationships with teens? This workshop will help youth development professionals, mentors, and program leaders identify best practices for teen mentoring programs and implement those best practices in order to deepen the impact for the teenagers in their program. It’s no secret that bullying remains a prevalent and serious problem in today’s society. “When adults respond quickly and consistently to bullying behavior they send the message that it is not acceptable. Research shows this can stop bullying behavior over time.” This workshop provides mentoring practitioners with the tools necessary to ensure their volunteer mentor are equipped to respond appropriately to instances of bullying. Attendees will be invited to explore how the Memphis Grizzlies Foundation has utilized its mentors, partners, and professional basketball players to promote bullying prevention efforts in their community through its signature team mentoring model. We are in a time of unrest, doing our part to create a movement for change. Often both witnesses and victims of oppression, racism, sexism, classism, etc., we’re speaking truth to power, refusing to be silent. Our youth have joined the movement as well, no longer waiting for adults to get it right. We’d never admit it, but we’re exhausted. Yet we push on, guided by a burning passion to experience equality and inclusiveness. Our passion soon becomes a liability as our zest for the cause and physical and mental health begin to deteriorate. We will review both the power and cost of activism, learning that self-care itself is an act of resistance and political warfare that we (both adults and youth) must dutifully engage in to sustain the movement. What if mentoring programs were not in the business of "serving young people" and were instead focused on measurable outcomes for the adults engaged in mentoring relationships? For a moment, forget about funding... how would that change the way you run your program? In this session, learn how one agency in Minnesota is trying to do just that – say yes to continuing to provide high quality mentoring for the young people in their program but saying yes, AND offer a purposeful program aimed at social emotional growth and professional achievement for mentors using training, technology and networking for mentors. Learn how just-in-time training (JITT) and proactive mentor support can improve the impact of your mentoring program. Building relationships between mentors and mentees is key for youth mentoring programs. Combining creativity with a flexible developmental/instrumental approach from the mentor and meaningful activities can help the relationship move in the right direction. This workshop proposes that by helping mentors tap into their own creativity to support mentees, programs can enhance positive outcomes whether or not the program provides stand-alone creative activities. We’ll discuss how creativity positively influencing brain development and learning outcomes, experience simple art-based activities, and offer considerations for successfully integrating into your program. No previous creative experience required – you can already do this! To you have a desire to incorporate the arts into your mentoring program but don’t know where to start? This experiential workshop offers a structure, best practices, and project ideas that mentors can engage in alongside their mentees. The projects and ideas presented all take a trauma-informed approach and focus on offering creating a safe space where children can express themselves. Do you have all the mentors you need? Most programs struggle to recruit enough mentors to meet the needs of the young people interested in the program. In this session, we will explore the concept of targeted mentor recruitment and how you can use it to find mentors who are likely to stay with your program long term. You will leave this interactive session with ideas to maximize your recruitment efforts and a template for a recruitment plan that can be used by individual staff or a team. Our country and world are in the midst of extreme divides driven by Cultural, Political, and Religious backgrounds and beliefs. Sport has the power to bring youth and communities together across these divides. This workshop will re-define what it means to be a sport coach while also exploring how the role of mentor coach is key when creating a safe space for conflicting groups to come together. Participants will learn more about the model PeacePlayers uses to bridge divides and develop youth leaders, how coaches from the community play a key role in that model as well as practical example activities and session plans that can be used. Effective prevention of substance abuse happens through community collaborations. Join members of Boys & Girls Clubs of America and local Boys & Girls Clubs as we highlight different types of community partnerships, steps being taken to address substance abuse and practices to integrate with your work. Participants will leave with specific ideas to engage and partner with their community. This workshop presents a cross-cultural collaboration between research and practice. Focused on implementing attunement practices across the mentoring system, this workshop will provide examples of how to enhance attunement in mentoring programs, as well as how attunement can facilitate and support the high quality mentoring relationships most central to the mentoring intervention. Across the country, youth serving agencies are making efforts to increase youth voice and input in programming. Even with these strides, young people are often asked "share their story" or give "feedback", but are not provided the opportunity to impact real growth and change. This session will focus on creating authentic collaboration with youth and young adults to improve program outcomes and provide professional development opportunities for young leaders. Presenters will also share information on the Youth Catalyst Team, and discuss the practices being implemented to advance the field. The new wave of disruption in education: innovations that deepen and diversify students’ access to new adult relationships and networks. We will examine dramatic shifts in the way schools and organizations are empowering students to forge new connections—and ultimately opportunities—that would otherwise be out of reach. Technology-based online mentoring can expand access to mentor pools in any location and eliminates the need for mentors to travel to schools each week to participate. Corporate partners can engage a local, regional, or national base of employees in any geographic location. Online programs can be offered to mentees in hard-to-reach communities. And while the online mentoring technology can present relationship development challenges, it also can unlock authenticity, eliminate shyness or differences in age, race, gender or differing abilities that can be prominent in face-to-face interactions. How might we design mentoring programs to cultivate specific learner outcomes such as purpose, empathy, critical consciousness, agency, self-regulation, and self-awareness? Transcend’s (free and open source) Graduate Aims Database is a growing collection of summaries focused on research-based learning outcomes that mentoring organizations often take influence from when constructing and designing for their own graduate aims. Each summary includes information to help define and measure the outcome, insights into how the outcome develops, potential design implications, and debates or nuances related to the outcome that often have critical equity, inclusion, and justice implications. While the high tech of social media, texting, and email are fine ways to maintain relationships, at Generation WOW, we’ve learned a different approach to bringing a laser depth connection when starting a new mentoring relationship with girls. Mentors and mentees write authentic letters to their younger and future selves. We share them. Then we walk and listen. Exchanging letters, walking together, allow for easy conversation and deep listening between our girls and mentors. We call it WOWsdom! In our workshop you’ll experience the process firsthand. What will be your next step? Come join us and let’s explore together. BAM leaders will provide this workshop to offer participants a deep dive into the BAM program model, its social emotional learning, educational and crime outcomes and share lessons learned from the practitioners perspective about building evidence and scaling what works with youth. Learn about the characteristics of BAM circles and Youth Guidance’s approach to training, selection and coaching of BAM Counselors to achieve high fidelity to the program model. Participants will experience an example of the check-ins, stories and group missions that comprise the BAM curriculum and a series of qualitative research interviews with youth in BAM. The proposed workshop presents considerations and strategies for establishing an effective school-based peer mentoring program. We will explore benefits and challenges to school-based peer mentoring and share best practice recommendations for program design and implementation. The Peer Group Connection (PGC) program will be presented as a case study example of an evidence-based model that has been successfully implemented in over 200 schools across the country since 1979. Participants will learn evidence-based practices for developing student mentors who are strongly connected through caring relationships with adults and peers and highly capable of using leadership, academic, social, and emotional skills. According to MENTOR, an estimated 16 million young people have never had an adult mentor of any kind. To address this stark mentorship gap, the U.S. Soccer Foundation uses an evidence-based program to facilitate group mentoring with high-quality trained coach-mentors. Come learn how intentional program design ensures thousands of coach-mentors across the country have the tools they need to be impactful mentors and yield positive social outcomes with the youth they serve. Participants will walk away with methods and tools to improve their own group mentoring initiatives. Young men of color in high-need communities are an integral part of the solution to addressing complex challenges. They have the requisite experience and skill to inspire young children to excel. This workshop will explore the power of placing young men at the center of change in the educational system. Participants will hear directly from young men from across the country who are leading a national movement to diversify the teacher pipeline while serving the youngest and most vulnerable in their community. Participants will leave the workshop with concrete skills concerning how to engage young men of color in meaningful mentoring experiences that result in developing community change agents. Traumatic experiences related to violence exposure are of particular concern for urban youth of color in conjunction with the naturally turbulent time of adolescence. While attempting to mediate this, traditional methods of mentoring interventions have been largely insufficient. This workshop is designed to help participants gain a greater understanding of this context. A focus will be placed on a transformative, trauma-informed, culturally relevant, community-based, cross-age peer mentoring intervention tailored to the specific needs of this population. Participants will gain valuable insights (hearing directly from the youth) and skills (trauma-informed strategies) needed to maintain a helping role when working with at-risk youth of color. Capacity building investments play a critical role in advancing a nonprofit’s ability to grow their infrastructure, improve their program quality and scale their work. Learn how a variety of funders approach capacity building investments, how they made the case to their board/trustees, how they have bolstered their investments with wrap around support and why they think these investments play a crucial role in achieving impact. This session will help funders think about how they can incorporate capacity building support into their funding portfolio as well as educate mentoring practitioners and youth serving organizations on how to leverage the resources that already exist, identify similar funding opportunities and help their existing funders see the value of making a capacity building grants to their program. Mentoring is a viable strategy to elevate diversity, inclusion and equity in our companies and communities. In this session, we will hear from Nike, E*TRADE and LinkedIn on how they have piloted an innovative mentoring model to advance more internal and external mentoring. Featured speakers will share how the model can be replicated and deliver outcomes for youth, employees, shareholders and communities overall. The trauma of commercial sexual exploitation has a holistic impact, affecting body, mind, and spirit. Considered in the context of youth exploitation, often as young as 12 years old, the developmental impact is insidious. Mentoring, when integrated with other program services and supports, is an effective strategy to support youth as they begin their healing and work to achieve goals for their future. This workshop will share about different models in which programs are integrating mentoring to support youth to reach their goals for personal growth, education, and employment. Specific considerations in program design and delivery will be discussed. Refugee and immigrant youth bring many assets to our communities and programs. It's important to look at the way we are facilitating mentor matches, to promote assets of these mentees rather than focusing on deficits. Often times, we are not aware of how our language, activities, or opportunities might be discouraging participation or highlighting deficits. This session will utilize research and program examples to encourage asset-based mentor matches, while giving participants tanglible action items to take back to their own programs. Camp Mariposa utilizes a unique group and peer mentoring model to serve youth ages 9-17 who are impacted by a parent’s substance use disorder. Offered primarily in a camp setting, the goals of this year-round program are to reduce juvenile delinquency, delay first use and connect youth with trained adult mentors and peers. Workshop participants will learn about this award-winning program that provides targeted therapeutic support services to youth from both urban and rural communities. Researchers from LSU will also share promising findings from their recent evaluation of this innovative mentoring program. Many mentors are matched with youth from lower socioeconomic groups, and some evidence suggests cultural insensitivities and misunderstandings can contribute to early match endings. This workshop will share findings from a national study of match closures (STAR: Study to Analyze Relationships) highlighting how social class biases can erode mentors’ engagement with and commitment to their mentees and interfere with effective match support. Workshop participants will consider the implications of the findings for program practices, such as ensuring mentoring program models do not support deficit-based views of participating families and developing practices to more effectively bridge gaps in awareness and understanding. This session will share Higher Achievement’s implementation journey in effectively applying research-informed data practices, tools, and resources – in an actionable way – to create, reorganize, or improve youth mentoring programs and meet industry standards. Participants will learn how Higher Achievement utilized Elements of Effective Mentoring Practices and leveraged pro-bono expertise from corporate partners, research volunteers, and staff to identify strengths and gaps in their existing mentor program and how to improve upon both. Stop by the Summit Featured Author’s space by Grand Registration to meet leading voices in the mentoring field Donna Orender, Julia Freeland Fisher, and Dr. Brenna Bry. Meet author Julia Freeland Fisher, author of Who You Know: Unlocking Innovations that Expand Students’ Networks. This highly-reviewed new book addresses the process of providing evidence-based interventions for at-risk youth and families. It is unique in its coverage of both Home-based Family Therapy and School-based Achievement Mentoring. Many adolescents in this country, including those from poor and ethnic minority communities, are at-risk for behavior problems, academic failure, dropping out of school, gang-involvement, incarceration, family conflict, and substance abuse. This book addresses these issues and provides mentors and clinicians with detailed, common-sense instruction and complex case examples to facilitate reaching these youth and families and reversing the cycle of at-risk behaviors in their lives. Strong and caring relationships are critical to ensuring the social emotional wellbeing of students. With the rise of social media it has become easier and easier for young people to “disappear” into a virtual world that lacks in human connections and the consequences of isolation and loneliness have become more dangerous. It is imperative for schools and communities to work together to ensure that all children are seen and feel connected. Schools that create a culture where every student feels worthy have higher rates of attendance and ultimately stronger academic achievement. New York City has embraced a Community Schools strategy to amplify this approach. Over lunch, come learn how schools can be central to your approach to foster positive relationships and mentoring in your community. How can city government and communities develop youth-adult partnerships in their cities? How do they incorporate young people impacted by violence in their decision making and violence prevention implementation strategies? At the heart of Cities United's violence prevention approach, is youth voice and youth-adult partnerships in city government and community. Learn more about their Roadmap Academy Fellowship, an innovative program in partnership with city government and community for young leaders 18 - 24 years old, and their philosophy on youth civic engagement and youth-adult partnerships. It can be argued that the mentoring culture views the mentor as its noble “heroes.” But should this be the case? This plenary shall explore the lens in which we view both the mentor and mentee and ask the unflinching question of whether or not the “hero” narrative has inadvertently created an unequal relationship between both. And, if so, has it stagnated the potential growth of the mentee? Ultimately, we will explore a greater question: How would the impact of our mentoring organizations change if we viewed the mentee as the hero rather than the mentor? This session is invitation only. The Innovations in Mentoring Luncheon is a special program of the Philanthropic Partnerships Track designed for corporations, foundations and individual donors. The luncheon, which is sponsored by EY, will feature youth speakers from multiple corporate mentoring programs sharing their experiences from their unique program models, the impact of mentoring and their advice to those investing in and/or engaging in youth mentoring. Youth will highlight innovative practices, partnerships and programming as well as engage with participants in discussions focused on maximizing the impact of youth mentoring programs. NFL Super Bowl Champion, entrepreneur and mentorship advocate Roland Williams wants to help organizations committed to mentorship leverage the power of celebrity to increase mentor participation, student impact and donor support. Get ready, this highly interactive session will teach you: 1. Learn the three major pitfalls organizations make in trying to build relationships with celebrities and how to avoid them. 2. Learn how to maximize your ROI from celebrity partnership. 3. Learn about an innovative case student using celebrity partnerships for fundraising and implementation. There are nearly 2 million American children who currently have a parent in the military. Since 2010, over 700,000 American children have experienced a parental deployment and on average, military youth move between 6-9 times before high school graduation. Join members of Boys & Girls Clubs of America and local Boys & Girls Clubs to discuss the unique challenges these youth face and learn about how to serve these youth both on- and off-installations where their families may be based. Youth Voice is the active, distinct, and concentrated ways young people represent themselves throughout society. By building the skills of young people to engage in advocacy and awareness efforts, utilizing their voices in an empowering way, programs can strengthen their capacity to improve youth outcomes because young people will feel more engaged and heard. This workshop aims to inspire and deliver helpful tools to embed youth voice in advocacy and public awareness campaigns as well as to make advocacy accessible to the youth in your programs. Many mentoring programs have a goal of promoting positive youth outcomes and reducing negative outcomes. A large and growing body of research suggests mentoring can achieve these goals; however, little is known about the longer-term impact of mentoring interventions on youth outcomes or how best to support mentoring relationships for youth at high-risk for delinquency. This session will provide attendees with knowledge about recent research on the long-term impact of mentoring on outcomes of former mentees and tips regarding best practices for supporting matches involving youth at high-risk for delinquency, including strategies for supporting young adult former mentees after their match has ended. How does mentoring work? It is a highly individualized service, yet specific, research-driven guidance for programs remains scarce. Practitioners need more specific guidance about how to meet students’ needs. This presentation will draw on three large evaluations of school-based programs to present useful findings and indicate ways researchers can provide that guidance. The primary focus will be on the largest and most rigorous evaluation of Connecting Generations mentoring. Participants will leave the presentation with newly available tools and clear guidance about how to use them and build on the current findings. Researcher and practitioner perspectives will be represented. The Puente Project is a nationally recognized program that has been impacting the lives of underrepresented young adults in pursuit of higher education since 1981 in California, Texas and Washington. The model incorporates intensive counseling, a culturally relevant college writing course, and a mentoring component. At a time when there is so much national dialogue regarding education, race and immigration issues, the Puente Project continues to succeed in empowering students to achieve their educational and career goals and return to their communities as future leaders and mentors. Mentoring research highlights its impact on students' academic achievement which helps prepare students for career success. Mentoring also can have tremendous outcomes for employers who engage their employees in school and community-based mentoring programs. This workshop will explore the importance of and strategies for building relationships among schools, community-based organizations, businesses and youth. Hear multiple perspectives including CEOs, program managers and mentors who will share their experiences, lessons learned and advice for others seeking to collaborate across sectors to enhance academic achievement and employee engagement. This session will feature at least three philanthropic partners who have a history of investing in mentoring individuals with disabilities including the Marriott Foundation, Pearson, and Oak Foundation. Each will showcase their unique program model including the initial "why" behind their investment and engagement. Speakers will focus on how they have or plan to scale their work as well as key lessons that they have learned along their journey thus far. More than 1.3 million homeless students have been identified in America’s public schools--and, as mentoring organizations, you likely serve many of them. This workshop will explore the impact of homelessness on the social and emotional health of youth, as well as their academic achievement, and share evidenced based interventions and best practices for promoting the long-term success of young people experiencing homelessness. Participants will have the opportunity to participate in small group discussion to candidly discuss their agencies’ capacity to serve this vulnerable population and brainstorm collaborative approaches to support the holistic needs of homeless students in their own communities. The Project MALES IMPACT course uses culturally relevant pedagogy and curriculum to positively impact student mentors and participants. The Project MALES team will describe the training mentors undergo, the aspects of Critical Mentoring involved in curriculum planning, and the importance of showcasing the student's voice. Attendees will gain a better understating of how the deficit narrative surrounding Men of Color can negatively impact their experience and understand how privileges among mentors can impact their sessions. We hope to change the language and narratives used to create critical and meaningful mentorship. From program climate to match support, intentionally serving LGBTQ youth requires awareness, commitment, and program champions willing to work together to update policies, practices, and activities. This session guides attendees through key recommendations and best practices for providing high quality mentoring service to LGBTQ youth. Participants will learn about the development process for the LGBTQ Supplement and gain an overview of BBBSA’s LGBTQ pilot which has increased capacity across its Network. Attendees will be able to use the supplement to better assess their agency’s own policies, practices, and activities associated with reducing risks for LGBTQ youth. Too many students today are left with student loan debt but no degree due to ill-informed decisions about where to attend college and how much to pay for it. This session will explore the role of mentorship in helping students make better choices about their higher education path. Attendees will learn about the Alray Scholars Program, which combines mentorship, scholarships and financial literacy training to help inner city students who’ve dropped out of college get back on track and persist to graduation with a responsible plan for financing their education. Participants will come away with tangible, replicable ways to build communitywide networks of mentors, support, advocacy and resources to help students overcome the academic, financial and personal barriers to college completion. Research indicates that the field of mentoring needs to increasingly place a greater emphasis on the mental health needs of youth. Practitioners and volunteer mentors need mental health strategies & interventions to effectively mentor today's youth. This session will provide a hands-on, practical approach in how to help youth examine their thoughts, feelings, and behaviors, leading to more effective goal setting and youth outcomes. TeamMates has been in existence since 1991, a growing school-based mentoring program. In 2010, this organization set a new standard in becoming a strength-based mentoring program. Mentors and mentees discover their strengths, utilize conversation starters, and continue to affirm strengths language within the trust-building relationship. Both the mentor and mentee learn the practice of strengths spotting and unconditional support through the lens of what is right about one another. The organization has seen a significant impact on school districts, parents, and relationships and continues to honor the ripple effect of building engagement, hope, and wellbeing. The purpose of this workshop is to provide detailed research and evidenced-based strategies to better understand racism, systemic oppression and implicit bias to develop equity-minded change leadership in order to transform mindsets, skills and practices to advance transformative change in mentoring males of color. Furthermore, the workshop will emphasize methods to identify opportunities to recognize, intervene and manage perceptions, practices and strategies to further strength mission drive work in mentoring and improve academic and professional outcomes for males of color. The workshop will consist of (1) historical information on race and racism; (2) employment, unemployment, wealth, wage, hourly pay data by race; (3) defining racism, implicit bias, and oppression; (4) levels of racism, (5) explain equity-minded change leadership and (6) strategies and recommendations. There will be one small group activity. Friends for Youth, Inc.’s Emeritus CEO Becky Cooper pioneered SAFE (Screening Applicants for Effectiveness): Guidelines to Prevent Child Molestation in Mentoring and Youth-Serving Organizations in order to provide mentoring programs with the knowledge necessary to diligently screen mentors who will work with children. This workshop offers recommendations on screening and monitoring tools and processes, and on developing and implementing policies and procedures to ensure maximum safety. We also review what is known about child sexual abuse perpetrators, helping youth professionals understand what to look for and how to utilize their informed intuition when applying screening practices and utilizing screening tools. We are living in a time of activism, and much of it is being driven by youth. If we as a society want to see change occur at any level, we must have active and engaged citizens. What are the ways that mentoring can or should support civic engagement and youth activism? As we reflect on this question, issues of social justice and the aftermath of violence come to mind as we see daily images of youth who are fighting for change. How can we as mentors equip youth with the tools they need to engage and how do programs train mentors to be partners in youth engagement? This rich, complex topic is the subject of this plenary and will offer the audience a glimpse into the work of civically engaged youth and the mentors that have supported them. Stop by the Summit Featured Author’s space by Grand Registration to meet leading voices in the mentoring field Donna Orender, Julia Freeland Fisher, and Dr. Brenna Bry. Adolescents at risk: Home-based family therapy and school-based intervention This highly-reviewed new book addresses the process of providing evidence-based interventions for at-risk youth and families. It is unique in its coverage of both Home-based Family Therapy and School-based Achievement Mentoring. Many adolescents in this country, including those from poor and ethnic minority communities, are at-risk for behavior problems, academic failure, dropping out of school, gang-involvement, incarceration, family conflict, and substance abuse. This book addresses these issues and provides mentors and clinicians with detailed, common-sense instruction and complex case examples to facilitate reaching these youth and families and reversing the cycle of at-risk behaviors in their lives. Those engaged in program planning and implementation will also find this a useful guide to administrative and staff structures and research that support this work. Immigrant and refugee youth are the fastest growing population of young people in America. First- and second-generation immigrant youth make up one-quarter of all U.S. children. As the country faces demographic and social shifts and young people are exposed to more and more hostility towards immigrants and increasingly harmful immigration policies, proposals and practices, it is important we explore ways to create a positive counter narrative and support immigrant and refugee youth as they acclimate to into a new country and culture. This timely, interactive conversation will engage young people, leading researchers, funders, and audience members in a dialogue aimed at exploring the role mentoring can play in creating allies and support systems for immigrant and refugee youth who celebrate the social assets of multiculturalism and multilingualism and foster positive psychosocial development by promoting acculturation, social integration, and school adjustment. Join colleagues and unwind during this "all levels flow" yoga class. The instructor moves you through a series of poses that connect breath to movement. Breathing will be emphasized as you progress through a flowing sequence of poses to help you get out of your head and into your body. Your practice will grow and your sense of peace and balance will be restored as you flow through the yoga postures empowered by your breath. Mats provided, but please feel free to bring your own. This session focuses on recent research investigating different approaches for improving the quality and/or effectiveness of existing mentoring programs. Presenters will discuss what has been learned across several scientifically-rigorous evaluations, including the Mentoring Enhancement Demonstration Program, funded by the Office of Juvenile Justice and Delinquency Prevention. Panelists also will share findings from studies on Step-It-Up-2-Thrive and the National Quality Mentoring System. Attendees will gain a greater understanding, based on theory and research, about what is realistic in terms of mentoring program improvement—what are the options, what potential challenges are likely, and what might be expected in terms of potential benefits. Many industry surveys show that a lack of qualified workforce is a top concern for many U.S. employers and many say that their greatest needs are in the area of soft-skills (e.g. communication, customer service, creativity, collaboration, critical thinking). In addition, the unemployment rate for teens and young adults is three times higher than the national average, and more than 5 million young people are disconnected from education and employment. It is more important now, more than ever, that we equip our youth with skills and experience they need to be success. Join Boys & Girls Clubs of America to learn how to leverage youth-adult mentoring relationships to support career development in youth, overcome common challenges to engagement, and what a successful workforce development partnership can look like to prepare today’s youth for tomorrow’s workforce. An effective network-wide assessment framework is essential to agency success. Among other benefits, shared measurement promotes ease in outcome and impact reporting and helps secure sustainable funding. When making broad assessment changes, balancing research and practice is a challenge that requires substantial stakeholder input. This session reviews a three-year pilot process aimed at updating the Big Brothers Big Sisters of America’s Youth Outcomes Survey (YOS), creating a complementary Child Outcomes Survey (COS), and integrating these tools into a new technology platform. Attendees will learn about challenges, successes, and strategies to strengthen their own measurement and data collection methods. Sample pilot and training materials will be provided. Whether in a community or in schools, mentoring can be used a positive strategy to addressing racial inequities. When a young person is matched with a mentor they (together) have an opportunity to have real life discussions about racial equity. Mentors have an obligation to providing a cultural humility space and can provide the space to have race based conversations. However, prior to having mentors have these conversations, there is a need for program staff to also be aware of and make space for conversations around racial equity. Participants in this workshop will discuss Friends of the Children’s “two gen” program innovations resulting from findings in a 2017 qualitative foster and bio caregiver study funded by the Annie E. Casey Foundation. Participants will learn about how to strengthen relationships with caregivers to improve not only youth well-being, but also family stability. New foster and bio caregiver engagement program enhancements will be discussed, as well as an innovative pilot recently launched in Los Angeles where non-profit service providers working with foster youth alumni are referring parents with 4-6 year old children to join the Friends of the Children program. Are you losing out on mentees because you don't have strong mentors in their locations to support them? Are you losing out on mentors because of time, mobility or other logistical contraints? Have you thought about the potential of ubiquitous mobile technologies to transform the reach of mentoring? If you have these questions in mind, then this is the session for you to attend. In this session, we aim to help you understand how mobile technologies can be leveraged to create strong relationships and impactful matches. This session will detail the One Heart model and approach for building a collective impact solution for specific youth populations - in this case youthful offenders - through cross-sector collaboration that produces a comprehensive framework and will help participants explore strategies for building and scaling similar efforts to other populations and communities. In addition, this session will detail innovative technology that produces greater sustainability of mentoring relationships. All programs, even those with limited resources, can conduct an evaluation. Evaluation can be beneficial for better understanding a program’s strengths and weaknesses, and results of an evaluation can be used to drive programmatic decisions. In this workshop, the audience will learn about the benefits of program evaluation, see examples of how results can be used to make decisions, and learn about the evaluation process. The audience will also participate in interactive exercises to learn about conducting an evaluation, and learn about free resources available to help with evaluation. This session will provide a brief overview of Check & Connect (C&C) and share how mentors track students' weekly attendance, behavior, and course performance in order to provide personalized and informed mentoring sessions. Learn about the C&C mentor's role, which focuses on increasing student engagement in school, partnering with families, aligning resources to build resilience, and promoting student success. With the use of C&C, mentors help meet the needs of the school to keep students engaged, and gather the data community-based agencies need to demonstrate measurable and meaningful outcomes to build sustainability. Sea Research Foundation (SRF) has helped many sites successfully enhance their group mentoring programs with structured science, technology, engineering, and math (STEM) activities. Come learn about the research behind this approach and hear what SRF has learned from implementing STEM mentoring programs with thousands of youth ages 6 to 10. As part of this interactive workshop, you will sample a hands-on STEM activity and will learn how to incorporate STEM activities within your own group mentoring program to help youth improve on social, academic, and behavioral goals. oLooking to evolve your programming to better speak to the needs of today’s youth? Engage with relevant and practical information, resources and activities to learn about how to promote critical mentoring and critical consciousness development through a group mentoring model. Content is based on one positive youth development organization’s journey designing, implementing and evaluating a group mentoring model that promotes critical consciousness development among adolescents. Walk away with curriculum and evaluation tools to help you strengthen your program in service to youth. Hear from program and evaluation staff that led the four-year group mentoring pilot and evaluation. A successful evidence and research-based socio-academic intervention model featuring a powerful multisector alliance, mentoring, technology, and motivation saves hundreds of children from school abandonment and academic failure. Presentation of results for participants of the One on One 2016-2017 edition and the results of the research conducted by University of Seville’s (Spain) Social Anthropologist, Dr. Isabel Martínez. This session will feature unique business to business partnerships including LinkedIn, Starbucks, and JPMC. We will highlight how these partnerships emerge, how to align them to community goals while differentiating each partner's unique contributions, and how to measure results for all stakeholders invested. We will feature case studies on existing partnerships and tools to help facilitate new partnerships as well. Participants will learn how to strengthen, expand, and implement youth mentoring activities and youth development programming for Native youth incorporating the Elements of Effective Mentoring Practice, and hear from successful mentoring programs…. This workshop will provide participants with practical examples of how to include individuals with disabilities in their mentoring programs and organizations. Participants will learn about a pilot program implemented at Lakshore Foundation for individuals with disabilities. Additionally, presenters will provide effective evaluation methods with an overview of the results from the Disability Awareness and Mentorship Program. Many mentoring agencies are exploring new and innovative approaches to connect with mentees’ parents and families. In this interactive workshop, participants will learn how a festive Parent/Mentor Meet & Greet can support the mentoring relationship development through offering mentors and families the opportunity to meet one another for the first time. Participants will also receive best practices along with resources and tools to assist their ability to host a meet and greet through their program. Moreover, this session will provide opportunities for agencies to share their experiences with parents and families, and what approaches agencies have implemented surrounding parent engagement. Both new and established youth development agencies without formal mentoring programs have volunteers who can be vitally important in helping youth navigate their identity and open doors to educational and career paths. This interactive workshop introduces volunteer managers to the developmental relationships framework as a means to mobilize adults to seek out opportunities to mentor the youth they encounter when volunteering, which expands the reach of caring adults from within their existing social networks. Participants will leave with practical tools and be equipped to encourage growth mindset development in volunteers and youth. Protecting child participants is the obligation of all mentor programs and proper screening can protect children emotionally, physically and sexually from mentors who may mistreat them. For most of us, this is what keeps us awake at night. It is most important to note, that every interaction with a potential mentor prior to match is an assessment of the candidate. In this session, benchmarks for screening new mentors are examined to ensure the onboarding process is comprehensive. By assessing commitment and suitability of candidates initially, programs can prevent mentor withdrawal and rejection for the mentee. After 40 years of serving vulnerable children and families in Fairfax County Virginia, BeFriend-A-Child is prepared to deliver a training with concrete samples to further improve other program interactions within the onboarding and screening process. In addition, participants will apply what they are learning before leaving the session and create a plan to implement benchmarks and innovative questioning in their own programs. The first step in the Elements of Effective Practice is a solid recruitment plan. Want to learn the best ways to recruit new mentors? It starts with you! During this workshop attendees will spend time learning about the "Principals of Persuasion" then we will will apply those skills by creating effective personal and mission based statements, leading up to a simulated speed networking session and a discussion on how to screen out mentors that might not be the right fit for your program. This workshop is all about you, and gaining skills to build the best team of volunteers. These skills can also be modeled to host networking sessions for mentor/mentee match events. This session will provide attendees the opportunity to engage and network with other Grassroots programs. Attendees will first hear from the Thomas Mentor Leadership Academy about their program and model then be given the opportunity to share successes, challenges and tips. Topics include fundraising and how to leverage their unique strengths in partnering with their local government agencies, other programs and community stakeholders. Attendees will also receive information on how to engage MENTOR: The National Mentoring Partnership and their Affiliates for training and resources. What role does risk play in the lives of adolescent youth? How can we understand individual and environmental risk to better identify youth and cater to their needs. Mentor Together and the Centre for Budget and Policy studies present learnings from a 3 year quasi-experimental study that tracked 200 youth across high-schools. We will share how a risk index was constructed, how mentorship models were created to cater to youth needs over 3 years, and the results across a range of psycho-social well-being indicators. Collective impact is grounded in the belief that communities must work together to change complex systems. Developing, sustaining, and monitoring high quality mentoring programs can be a challenge in large urban areas. Legislative support for mentoring initiatives contributes to the growth and sustainability of mentoring programs. Las Vegas My Brother’s Keeper Alliance and Nevada Advisory Commission on Mentoring will offer research on collective impact as an advocacy tool and provide examples of how this model can be used to promote mentoring initiatives. Participants will spend time in this session developing strategies to engage policy makers in their own communities. In this session, participants will learn about low-cost, easy-to-implement strategies for 1) assessing and monitoring program implementation fidelity, 2) measuring the ways in which peer mentoring positively impacts program participants, and 3) utilizing implementation and impact data to gain support from stakeholders for continuous improvement, program sustainability, and program expansion. Which mentoring relationships flourish and which fail to have the desired impact on youth? Using data from two large randomized trials with well-established mentoring programs in the US and Mexico, this workshop will introduce research findings on the ways in which mentor and youth background characteristics and expectations can influence the quality, duration, and impact of their mentoring relationships. We will discuss evidence-based tools that can be used to assess these characteristics at baseline in order to inform recruitment, matching, and training practices. It is no secret marketing and communications are essential to the success of a non-profit. However, limited resources and a maxed-out team often impedes the ability to fruitfully implement strategies. This workshop will unveil the richest resource within an organization: the mission statement. We will explore the essential elements of effective communications plans and optimal marketing tools to share your story and reach your goals...at little to no cost while maximizing your team’s capacity. This workshop is best for attendees who have a basic understanding of marketing and communications and are looking to take it to the next level. In 1968, after hundreds of urban protests, the National Advisory Commission on Civil Disorders – known as the Kerner Commission – concluded that America was heading toward “two societies, black and white, separate and unequal.” Fifty years later, in 2018, the Eisenhower Foundation concluded in an Update that, in many ways, the nation has failed in reducing poverty, inequality and racial injustice. During this Workshop, Dr. Alan Curtis and Dr. Dorothy Stoneman, two of the authors of the Kerner Fiftieth Update, Healing Our Divided Society, will set out a framework for integrating the mentoring movement, the evidence based movement, the priorities of the Kerner Commission, the priorities of major foundations and the need for “new will” among the American people. This workshop will explore the importance of introducing mentors to the Adverse Childhood Experience study (ACEs). As it will examine the way childhood experiences, both positive and negative; have a tremendous impact on future violence victimization and perpetration, and lifelong health and opportunity. This session will provide an opportunity for participants to learn more about the benefits of corporate mentoring volunteer programs, as well as lessons for how to operationalize such a program for the greatest impact. Corporations looking to expand their community impact through local mentoring, either to form a new program or tighten or expand an existing one, will walk away with scalable models and resources to bring back to their organizations. The session will include a panel discussion from corporate leaders who have activated such programs in their own organizations sharing best-practices, strategies, and results followed by an audience Q&A and facilitated workshop. Corporate engagement in mentoring is expanding, and employees are a viable source of mentors for the mentoring field. This session will feature employee perspectives and experiences from diverse companies and industries -- featuring finalists from the Corporate Excellence in Youth Mentoring award. Each featured employee will highlight their specific mentoring engagement including what motivated them to sign up, what keeps them engaged and supported, and what they have learned along the way. They will share their firsthand advice for increasing employee engagement and closing the mentoring gap. There are an estimated 440,000 young people in foster care in the US at any one time, and even more affected by it. Silver Lining Mentoring strives to support young people affected by care through volunteer mentor relationships. Through this workshop, SLM will share their effective ways of supporting young people in care with a focus on supporting the disproportionate representation of young people of color and LGBTQ+ youth. This workshop will utilize active disussion, empathy building and self reflection around cultural responsiveness. "One in five Americans have a disability, many of which are hidden disabilities. Trauma survivors are more likely to develop mental illness and about 35% develop learning disabilities. This training will examine the intersection of disability and trauma. In it, we will review common trauma responses, common triggers, and trauma informed principles that we can apply to the work that we do with our mentees. The training will be a mix of content and interactive scenarios and participation is highly encouraged!" This workshop builds on both the historical and contemporary methods, practices and theories pertaining to the mentorship and development of young men of color, and addresses the “missing link” between men of color in college and high school. By focusing and centering the power of youth voice and advocacy, we are proposing an innovative and unique model that can be replicated across college campuses and local school districts. Using the Brothers at Bard program as a case study, participants will be given the opportunity to engage intellectually and practically with a mentorship model that positions collegiate men of color as the best possible mentors for men of color in high school. This is a twofold model that meets the needs of men of color in high school and college simultaneously. This workshop also discusses specific mentoring tools and strategies for our model's target group (men of color ages 13-21). The session will explore the unique challenges and risk factors faced by Asian American youth and demonstrate how a mentoring program built around a cultural framework that caters to the distinct needs of Asian Americans creates a space that supports youth to develop the skills they need to be confident, engaged, and successful. The session will conclude with practical tips and tools utilizing AALEAD’s 20 years of lessons learned, program evaluations, and input from participating families and youth. From recruitment to relationship building to programming, we’ll share examples of how culture plays a role in the different aspects of mentoring. We are losing young lives. Suicide is the second leading cause of death among youth ages 10-24. One in five youth are diagnosed with a serious mental health disorder between the ages of 13-18. The reality is that all mentoring programs serve youth with mental health needs. Learn the evidence-based quadrant model that Compeer offers: a close collaboration between the youth and their parent, the referring therapist, the mentor and the program staff. Learn the common mental health disorders among youth, the latest suicide trends, as well as how to engage wait list youth and provide supportive group activities. More than seven million U.S. students are chronically absent each year- meaning they have missed a month or more of school. This interactive session explores the pernicious effects of chronic absence and features an "Every Student, Every Day Success Mentoring Toolkit" developed through the New York City Community School Initiative. Deepen your understanding of the elements of a developmental relationship, based on Search Institute's research. Explore how it connects to current interests in equity, SEL, and trauma-informed care. And identify concrete ways to use the framework with staff, mentors, and other stakeholders. Participants who attend this workshop will have an opportunity to learn mentoring coaching skills from an ICF (International Coaching Federation) certified coach. Participants will learn the key principles of coaching and experience key coaching tools that are effective in mentoring relationships. Please bring hour mentor / mentee match questions and be prepared to role up your sleeves to practice coaching. This session will provide participants the unique opportunity to hear directly from a panel of current mentors and mentees to understand The Clubhouse Network group mentoring model, reflect on how the mentoring relationship can promote youth leadership and youth voice, and explore strategies to support the mentor-mentee relationship. The session will include an overview from Clubhouse Network staff, a practitioner viewpoint from Computers4Kids in Charlottesville, VA, a facilitated panel discussion with the youth and mentor panel, and a participant Q&A session with the panel.